When we were little, our parents taught us not to talk to strangers. I sometimes wonder if my boyfriend's parents ever warned him of the dangers, because he talks to strangers all the time. He's a master chatter. He makes best friends with cashiers, older ladies love him, and he somehow induces perfect strangers to tell him their life story. And so it went when we paid Barry from Craigslist a visit to see about some copper pots. One thing led to another, and before long we were two hours deep in conversation about his past life as the executive chef of a cruise ship making its maiden voyage in 1969. We left Barry that afternoon with a smile on his face, confident that his prize pots had found a good home. And we walked away 3 copper pots, a handful of cookbooks, and a few stories richer. I've grown particularly fond of one of the books we picked up, The Best of Vietnamese & Thai Cooking, written by Mai Pham, chef/owner of Lemon Grass Restaurant in Sacramento, and Barry's former instructor at the Culinary Institute of America. When I spotted Pham's recipe for Thai Seafood Curry with Pumpkin and Fresh Basil, I was reminded of one of my favorite dishes from Osha, Pumpkin Curry. While Pham's recipe calls for mussels, salmon, and shrimp, I decided to go with simplified, vegetarian version using roasted butternut squash and a touch of tomato paste. I also happened to have some leftover pan-fried, extra firm tofu on hand, so I threw that in for some more substance. You will fall in love with this fragrant and full-flavored curry. The two magic ingredients I discovered in this recipe are lemon grass and Kaffir lime leaves, both acquired at Whole Foods (along with my red Thai curry powder). They infuse the curry with the most seductive aroma. Fresh and citrusy, with a touch of spicy floral essence. Do not skimp on these ingredients. They will transform your dish. Lemon grass can look intimidating, but don't be scared. 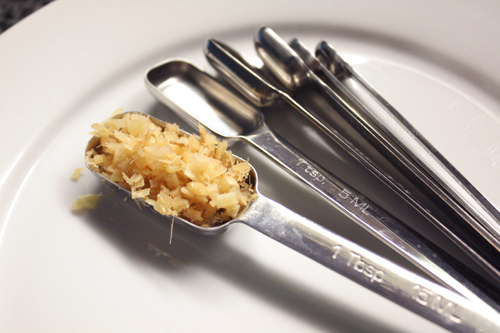 To prep and make the most use out of it, first peel off the tough, outer layers of the stalk. Thinly slice from the fatter bulb end first. Stop when you get to the green parts of the stalk on top. Cut these top green parts into 2-inch pieces and set aside. You can use these for your curry, simply bruise them with the back of your knife, splitting the stalk open and releasing the essential oils. The thin slices from the bulb can then be minced (use a food processor to make your life easier) and stored in Ziploc bags for up to 4 months or so in the freezer. 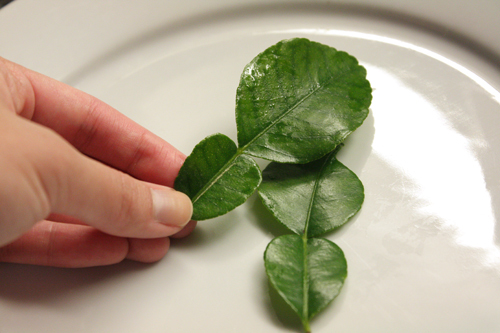 I store my lime leaves in the freezer as well to extend their shelf life. A trick I learned when working with butternut squash -- it can be tough to cut through and peel when the squash is raw. If you microwave the entire thing for a few minutes, it will soften up, allowing you to slice through it easily. Pham cooks her squash right in the curry, but I found that roasting it first really develops its flavor and is totally worth the extra time! Serve it over some coconut rice and you will be in Thai heaven. 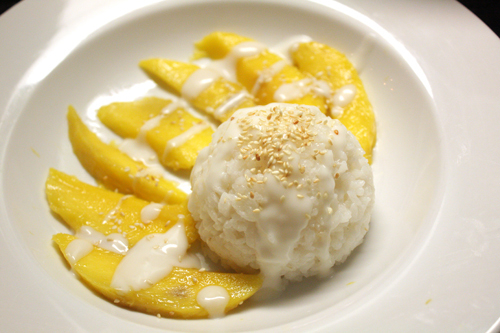 Coconut rice is used in a popular Thai dessert, served with slices of sweet, juicy mangoes. 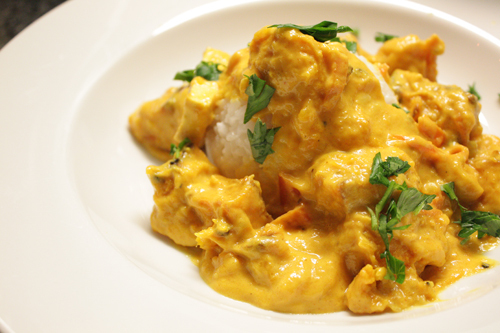 It also happens to make a wonderfully aromatic base for your coconut milk-based curry. After craving it for all these years, turns out coconut rice is just cooked rice mixed with a simple coconut sauce. If you have a rice cooker, all you really have to do is whip up the sauce (just don't try dumping the sauce in with the uncooked rice all at once…that um…doesn't work out too well). And if you don’t have a rice cooker, steaming rice in a pot is easy too. So there you have it. A complete delicious Thai meal, made in a pair of beautiful copper pots. Thanks, stranger. 1. Preheat oven to 450 F.
2. 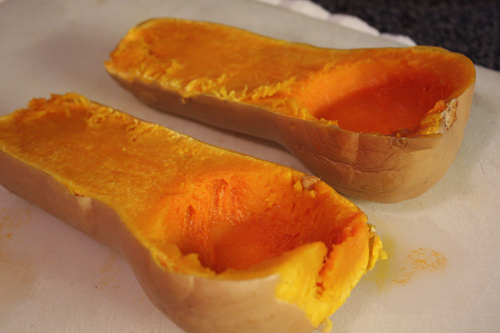 If not using pre-cut butternut squash, microwave whole squash for about 5 minutes to soften so it’s easier to cut. 3. Remove skin, scoop out seeds, and cut into 1 inch cubes. Drizzle with 1 tablespoon olive oil, pinch of salt and pepper, and roast for 30-40 minutes until browned. 4. 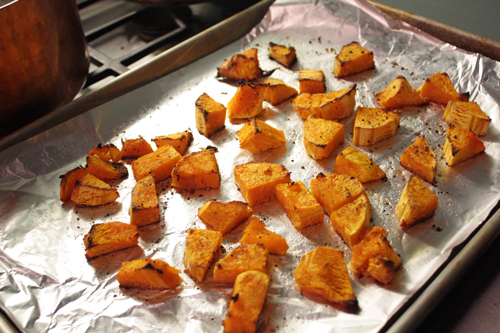 Remove squash from oven and allow it to cool. 5. Meanwhile, heat a large saucepan over moderate heat. Skim off the top thick, creamy part of the coconut milk, about ½ cup, and add it to the pan. Add the curry paste and stir to dissolve. Let mixture sizzle and bubble for 2 to 3 minutes. 6. 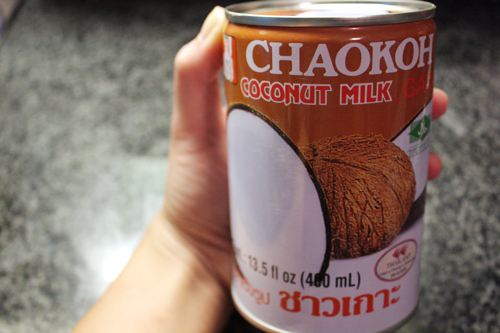 Reserve 2/3 cup coconut milk in a small saucepan for the coconut rice. Add the remaining coconut milk, lemon grass, lime leaves, sugar, fish sauce, tomato paste, turmeric, and salt. Increase the heat to high and bring to a simmer. 7. Add the tomatoes and let cook for about 10 minutes until they dissolve. While this simmers you can prepare the coconut rice (recipe follows). Add roasted butternut squash and allow to simmer for another 5 minutes. 8. Serve over coconut rice and garnish with freshly chopped cilantro or julienned basil. 1. If you have a rice cooker, mix together the 1 ¼ cups water and 2 tablespoons sugar, and combine with the rice. While the rice cooks, prepare the coconut sauce. 2. 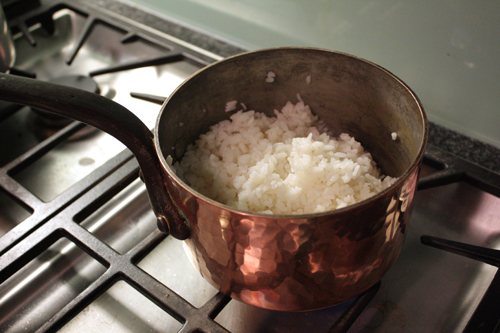 If you do not have a rice cooker, bring the water to a boil in a medium saucepan. Quickly stir in the rice and add the 2 tablespoons sugar. Let boil for 2 minutes, then reduce the heat to very low. Cover and simmer only until the water has evaporated and the rice is tender, 8 to 10 minutes. Remove pan from heat and let sit for 20 minutes. Uncover and fluff rice with a fork or chopsticks. Set aside. 3. Prepare the coconut sauce: in the small saucepan with the coconut milk reserved from before, add the ¼ cup sugar, vanilla, and salt. Bring to a boil. 4. In a small bowl, mix the cornstarch and 1/3 cup water and stir until dissolved. While the coconut sauce is simmering, slowly drizzle in the cornstarch mixture and stir until sauce is thick enough to coat a spoon. Remove from heat and set aside. 5. Drizzle the coconut sauce over the rice a few tablespoons at a time to taste. 6. If you're serving this as a dessert, place a small mound of sticky rice (about ½ cup) in the center of a serving plate and surround with mango slices. Drizzle some more coconut sauce over each mound and sprinkle with sesame seeds.